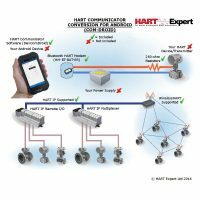 What are differences between the HART Communicator products? For a summary please see our comparison tables. What is a DD file, and DDL and EDDL? DD stands for “Device Description”. A DD file is a small file that defines the capabilities of a HART device. The language used in DD files is “Device Description Language (DDL)”. The Device Description Language is defined in IEC 61804-2 and IEC 61804-3 as “Electronic Device Description Language (EDDL)”. Hence often DD files are mistakenly referred to as DDL files, or EDDL files. Please see “The three HART Command sets” FAQ for more information. Is there a list of the included DD files? Yes, but remember not all devices have or need DD files, it is only HART devices that use the “Device Specific” HART command set that have DD files, see “The three HART command sets” FAQ for more details. The list of DD files currently released by the HART Communication Foundation and included with our HART Communicators is here. Where can I get the latest DD files for HART products? How do I configure a HART Transmitter? I have a HART Transmitter, how can I communicate with it and view/change a setting in it? 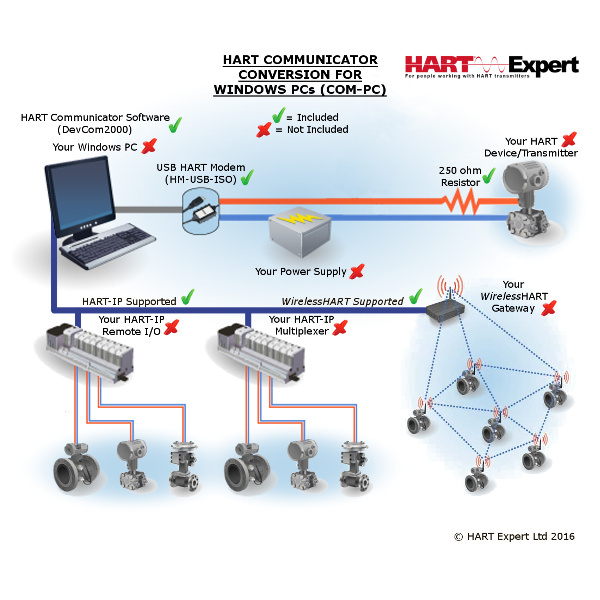 In principle you need a HART Communicator (also called a HART Configurator). However, as HART technology has progressed over the last 30 years many HART Communicators on the market are based on older technology and so now do not support all HART devices. There are primarily three types of HART device; 1) the traditional 4-20mA wired HART devices, 2) HART-IP devices, and 3) WirelessHART devices. Additionally there are three HART instruction sets used for HART communication; a) Universal commands (supported by all HART devices), b) Common Practice commands (supported by most HART devices), and c) Device Specific commands. See “The three HART command sets” FAQ for more information. The HART specification defines three command sets; “Universal”, “Common Practice”, and “Device Specific”. All HART devices must support Universal commands, most HART devices support Common Practice commands, and most HART devices make use of Device Specific commands. Both the Universal and Common Practice commands are fully defined by the HART Communication Foundation. However, the functionality of Device Specific commands are defined by the device manufacturer, consequently if a device uses Device Specific commands the manufacturer provides a DD file which details the Device Specific commands used. The DD file is normally unique to a specific version and revision of a product. Not all HART devices have or need a DD file. The table below gives examples of the commands in each command set, the actual number of HART commands runs into several hundreds. Our HART Communicators support all three command sets. What is the difference between a 'RS232 HART Modem' (also called a 'Serial HART Modem'), a 'USB HART Modem', and a 'Bluetooth HART Modem'? RS232 HART Modems were the original HART modem, they were used before USB and Bluetooth existed. As a result all HART configuration software was and still is written to use a RS232 (Serial) COM Port for communication. ‘USB HART Modems‘ came latter and plugin to a PC’s USB port. ‘USB HART Modems‘ come with a software driver that makes the connected USB port appear as a virtual RS232 (Serial) COM Port. This software driver is called a ‘Virtual Serial Port driver’ and is why HART configuration software is written to use COM Ports and can work with both ‘RS232 HART Modems‘ and ‘USB HART Modem‘. 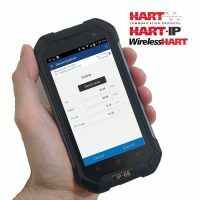 More recently Bluetooth has increased in popularity with Bluetooth HART Modems offering users the ability to communicate with wired (4-20mA) HART devices without needing a cabled connection to the HART Communicator/Configurator. Computers that support Bluetooth provide Bluetooth virtual COM port drivers, hence separate Bluetooth drivers do not need to be installed for Bluetooth HART Modems. I am a software developer and I want to write my own software to communicate with a 4-20mA HART transmitter. What do I need? You need either a ‘USB HART Modem‘ or a ‘RS232 HART Modem‘ (see the FAQ ‘What is the difference between a ‘USB HART Modem’ and a ‘RS232 HART Modem’?’). 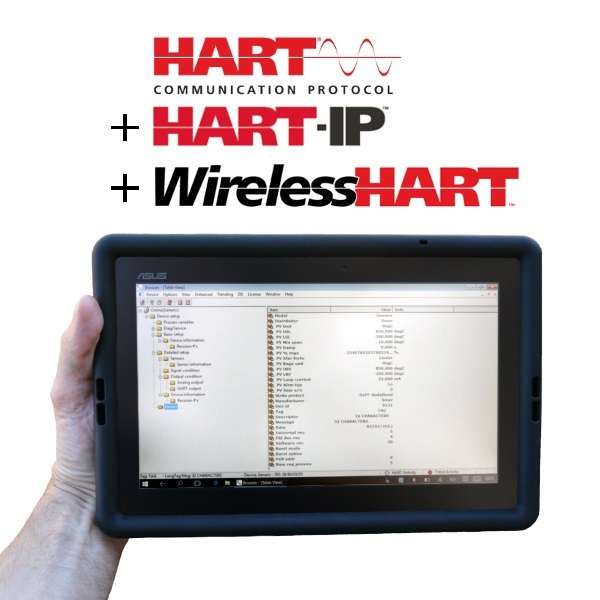 Using a HART Modem you can create your own software to read/write HART commands to the COM Port that the HART Modem is connected to. Thus you will be able to communicate with HART Transmitters. Note: You will also need to know the HART Communication Protocol (Instruction set). This can be bought from the HART Communication Foundation. I want to create a program in LabView to communicate with a 4-20mA HART transmitter. What do I need? You need either a ‘USB HART Modem‘ or a ‘RS232 HART Modem‘ (see the FAQ ‘What is the difference between a ‘USB HART Modem’ and a ‘RS232 HART Modem’?’). 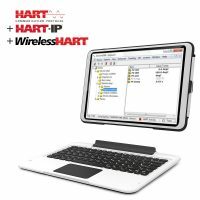 Using a HART Modem you can create your LabView program to read/write HART commands to the LabView PC’s COM Port that the HART Modem is connected to. Thus you will be able to communicate with HART Transmitters. NI have released a LabView HART example program which you can use (you also need to install LabView’s VISA I/O driver).